Every cardmaker we employ has a story of hope and personal triumph. Christine was already living at an orphanage before the genocide started. A few months before the fighting began, Christine's father took her and her siblings there, saying, "Do not tell anyone my name or your mother's name. If anyone asks, your parents are dead." That was the last time she saw him. When the opposition army finally liberated the orphanage area, she remembers a huge sense of relief. "I could finally stop fearing for my life," she recalls. "I had been hiding the whole time, afraid that someone would kill me. When we were liberated, I felt the freedom from hiding, freedom from death." Though Christine was no longer afraid for her life, she soon learned that her parents had died. In addition, the orphanage could not stay open, so she was suddenly in charge of her siblings. She was forced to find odd jobs, such as fetching large jugs of water all day to mix cement at construction sites. Life seemed hopeless, the work painful and endless. Even when she had enough money to buy food for one day, she was still unsure about the next. Now that she works for Cards from Africa, Christine has found people who have a similar background, with whom she can relate. She has steady work that pays well, allowing her to support her family. "I wrote a song to commemorate the genocide," she says. "It is a song that tells people that it is time to stop crying. It is now the time to move forward with hope." Christine hopes to one day go to college and get her degree. She would love to buy her own house, get married, and to have a family. But more than just hope for her life, Christine has hope for her country. "My parents' generation used to see people as different ethnic groups. But that is what led to the genocide. I have hope that Rwanda can be better as we learn to be of one mind, to see everyone as Rwandese, as one people." Just a few years ago, Florence could barely scrape together enough money to support herself, her niece and her infant son. Now, not only does she provide for their daily needs, she is even saving up for their future. When she was only ten years old, Florence was the only one in her family to survive the 1994 genocide, losing her parents, two little sisters, and a grandmother. When the genocide ended, Florence eventually found her uncle, but he was only a few years older than her, and he too had lost his parents in the genocide and could not help her much. It soon became clear that Florence had to look after herself. Barely eleven years old, Florence found a job as house help and then discovered that she had a half-sister nearby. They immediately hit it off and decided to live together and support one another. For a few years things seemed brighter, but in 2002 Florence's sister fell ill and died because they did not have enough money to see a doctor. Florence felt the crushing weight of the loss of her sister. She took her niece as her own daughter, but she felt that she had no reason to hope or dream. She struggled to pay rent and buy food, and each day was full of anxiety. But in 2006, Florence joined Cards from Africa, a company that specifically employs orphaned young people to make handmade greeting cards. Immediately she began to feel her burden become lighter. With a steady income, she no longer worried about whether she could buy food that day, or even the next week or month. Slowly, she has begun to save. Says Florence: "I am grateful for Cards from Africa. Not only do we have enough for today, but we have enough for tomorrow. Now, I don't just want to have enough to survive, but I want to have a brighter tomorrow. I am saving money so that my son and niece can attend university. A few years ago I thought that was impossible. Now, it seems possible." Theoniste is an aspiring artist who is full of love for all types of people. But his compassion has come despite terrible violence that wrecked his family. Theoniste was only 11 years old when the Rwandan genocide occurred. For 100 days, he and his siblings hid in bushes during the day, and went in search of new hiding spots at night. Luckily, they managed to survive. However, upon returning home, Theoniste discovered that both his parents had not. He and his younger siblings were all orphaned, and Theoniste, being the eldest, was now in charge of the family. Life was not easy. Theoniste quickly learned that if he wanted something, he had to fight for it himself, sometimes literally. "I had to grow up very fast," he describes. "You have to be tough if you want anything. We had no money, nothing to eat. I felt like no one could understand me, so I became very stubborn. If I wanted something, I would fight. I did not listen to others because there was only my way. That is what you had to do to survive." Then, in 2006 Theoniste found a job at Cards from Africa. At first it was not easy because he had to work in a team. "I would want to do things my way, and if others disagreed, I would want to fight. But as I spent more time there, I learned that they could understand my life." With the steady income he earned at Cards from Africa, he could stop worrying about affording food for his brother and sister. As he experienced the love and compassion of his co-workers, he learned how to be more loving and compassionate himself. "My favorite card we make is ‘Bunch of Hearts'. It is a card that shows love, and in my heart I feel like I have more love for everybody." When asked if he still gets into fights, Theoniste laughs and says, "These days, I prefer music to fighting. I like to play my friend's guitar. One day I want to buy my own guitar and learn to write songs." Before 1994, Germaine lived with her 9 brothers and sisters and her mom and dad, who were a businessman and a teacher, respectively. Both of her parents and her five eldest siblings were slaughtered in the genocide and she was left at age 11 as the oldest of her brethren, to care for her 3 younger sisters and 1 younger brother. In addition to losing her family, Germaine was left with a demolished house and no belongings. Her siblings were in desperate need of nourishment and clothing. Germaine was frustrated because she believed she was not supposed to be supporting these children who looked up to her as the almighty. Children would come to her for answers and she could not provide them with a response because what she had seen was beyond her grasp. After the genocide, Germaine spent a long time in loneliness, often crying for days and nights on end. She had a deep wound in her heart and wondered why she had not died as well, but instead left to care for these children while in need of a parent or guardian for herself. Germaine is now 23 years old and still looks after her siblings who are 18, 17, 15, and 13 years old. She now has an occupation at Cards from Africa and is able to earn money to pay rent for a house they can live in, feed themselves without depending on the goodwill of neighbors, buy clothes, and school supplies for their education. 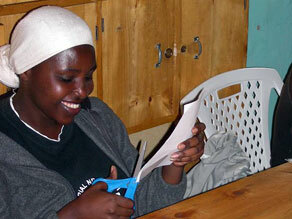 Germaine is proud to see a beautiful card made by her own hands. It also gives her joy to know that they are created from nothing or what was almost useless. She believes that God is part of this, that he has not foresaken her, and that brings her serenity. She is now able to enjoy the blessings of life with her dear ones because they are together. Someday, Germaine wants to start her own business, maybe a shop. Rachel is an 18-year-old who takes care of her 15-year-old sister and 12-year-old brother. She was just 7 when her dad died from stomach ulcers and only 11 when her mum died from AIDS. Her aunt eventually took them in but was too burdened by having three mouths to feed. She made life very difficult for Rachel including making her get up at 4 in the morning to do a heavy workload of chores. This led to many school absences and a lack of time to complete homework. She went from the top of her class to the bottom in just a year. Rachel and her two siblings soon moved back to the mud house they had lived in with their mother. By the time she had died, her mum had sold everything to buy food for them, The children were left to sleep on the floor of a completely empty mud house, wear tattered clothes, and when they did find food, it was a very poor diet. Since Rachel started working for CfA she has been able to do a great many things. She is now able to pay the yearly health care fee in case her brother and sister fall ill and need to see a doctor. She has purchased furniture for her home as well as new mattresses for them to sleep on. Her brothers and sisters are both eating well and wearing better clothes. The joy and dignity that come with providing for everyone's needs is a new experience for Rachel. All of our cardmakers lost their parents to either genocide or disease.